Ethnic Turkish population after the last census – in March 2002 – is about 33,000. There are about 11,000 Turks in Constanta, 4,000 in Medgidia, 2,000 in Mangalia, 200 in Eforie, 400 in Techirghiol. Due to urbanization, migration or emigration, rural population decreased. A significant Turkish community lives in Tulcea County: thus, in Tulcea are 1423 Turks, in Babadag 1289, in Isaccea 216, in Macin 337. 70% of Turks live in urban areas. They have a level of academic training similar to other ethnic groups, but there also are many illiterates (10%) or solely primary school graduates (20%). National Conference, composed of representatives of all regional branches, has to elect the Union's leadership – President, First Vice-President, General Secretary – every four years. 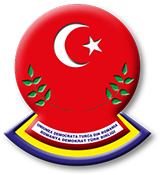 Our logo is a globe with the ethnic Turkish symbol – crescent and star, framed in the bottom by two olive branches which symbolise peace, and at globe's basis is the name of our organisation, surrounded by Romanian flag. We publish a magazine: Hakses – The Authentic Voice, being funded by the Gouvernement through the Department for Interethnic Relations.